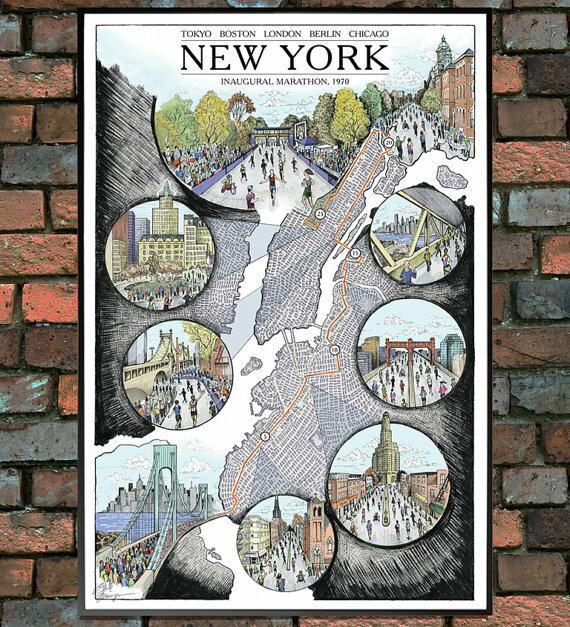 Giveaway: A NYC Marathon Map Illustration! Some great marathon related art out there!!! I still need a big piece for above my couch if anyone is feeling generous, but came across these amazing prints… from this site: Cape Horn Illustration Phil, the artist, is also a marathoner, who just did Chicago last year, so I see where all this inspiration came from. He offered to give me a print to giveaway, the NYC Marathon one, 12×18, in quality paper, signed and all. I think it’d make a fantastic addition to any wall or a fabo gift!! If you go to the site, you can see all the detail, the images zooms in! Anyway, giveaway is HERE, feel free to share the love and enter all you want. We’ll pick someone randomly on August 18th, at noon. You have many many options to enter, so don’t be left out! One thing: if you don’t live in the US, we’ll ship it to a friend of yours in the US to hold it for you, ok? Love seeing people fro mall around the world! I’m most excited for the crowds cheering! I love the artwork but I just saw this post!! I’m too late for the giveaway. Any way to get another one of these? I am sure you can buy one on his website, link is above.